Sean Kennedy, 10, of Locke, holds his New York State Fair prize-winning hen Friday afternoon. Kennedy won three first-place ribbons at the 4-H competition. 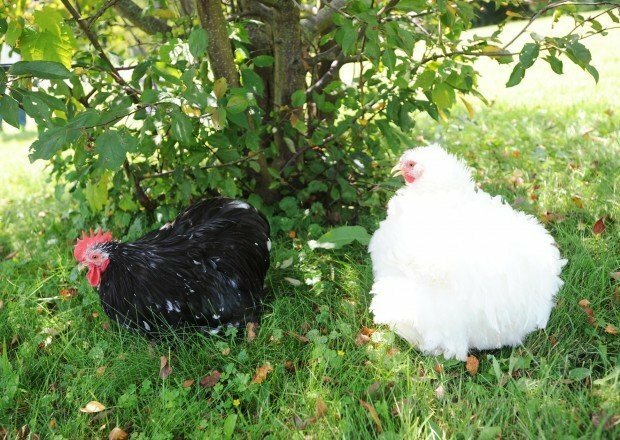 Sean Kennedy's prize-winning hen and rooster roam their lawn in Locke. Kennedy, 10, won three first-place ribbons at the 4-H poultry competition at the New York State Fair. Sean Kennedy, 10, of Locke, holds his New York State Fair grand champion rooster Friday afternoon. Kennedy won three first-place ribbons at the 4-H competition. 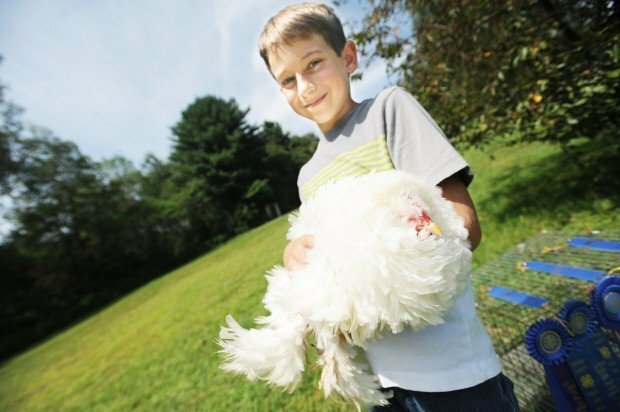 Sean Kennedy, 10, of Locke, recently added to his awards collection three first-place ribbons from the 4-H poultry competition at this year's New York State Fair. LOCKE | Sean Kennedy began to clean up his station as he waited patiently for the winners of the New York State Fair 4-H poultry show to be announced. The 10-year-old from Locke had just finished displaying two of his most prized chickens at the day-long show, but he wasn't expecting to walk away with many awards. Much to Kennedy's surprise, however, he ended up taking home three different prizes — all for first place. "I was stunned," he said. "I was hoping I would get something, but I wasn't expecting what I got." At the Cayuga County Fair earlier this summer, Kennedy entered his two bantam cochin chickens, Fluffy and Blu, into the 4-H competition and was awarded three ribbons. He took home first-in-show in the 8- to 14-year-old division, automatically qualifying him to enter the same birds into the New York State Fair competition in Geddes. Kennedy said he was nervous at first, especially as the awards were about to be announced. He said he began to pack everything up and wasn't really paying attention to the ceremony taking place around him. But when he heard his name called for first place, everything changed. "When I see that I've won, I get a big smile on my face and strut right up there like a peacock," Kennedy said. By the time the day was over, Kennedy had strutted three times. He won first-place ribbons for the best bantam chicken in his division, master showman and poultry junior champion, which declared his chickens the best in the entire show. Kennedy has been entering his chickens into shows for about three years. His love of the bird began when he was younger and would visit his grandparents' friends house and see the chickens they had in their barn. "I used to love playing with them," Kennedy said. "I loved feeding them, picking them up and collecting the eggs." By the age of 7, Kennedy had his own collection of chickens and started entering shows as part of his 4-H program. Anytime he told his parents he wanted a new chicken, he would complete household chores to earn the money to pay for them. He now has close to 50 chickens, in a variety of breeds, that he keeps in a coop behind his family's house — and he works hard to take care of every single one of them. "Sometimes I have to tell him to just get some sleep and not go out to the coop so early in the morning," said Sean's mother, Tracie Kennedy. She said her son spends as many hours as he can each day playing with the chickens and caring for them and the other animals the family has behind the house. The time he spends with them can sometimes get away from him. "He's actually slept in the chicken coop before," Tracie said. Sean explained that there is a lot of work involved in preparing chickens for shows, including a great deal of grooming. In the short time he's been competing, he has taken home 15 different prizes, six of which he won in the past few months. All show the growth he's achieved in such a short period. The ribbons in his collection range in different places and categories, but of all the prizes he has been awarded, Sean said being named master showman, which measures one's knowledge of a particular breed of chicken, is what makes him the proudest. "Anyone can buy a nice chicken, but not anyone can win the showman award," he said. Tracie said she and her husband were also members of 4-H when they were young, and although she is happy to see Sean follow in their footsteps, the simple fact that her son found something he loves so much brings her the most joy. "He works really hard, and nobody pushes him to do this," she said. "He just has a special gift of knowing about chickens, and I'm really proud of him. This is just his thing." Later in September, Sean will enter his prize-winning bantams into his first non-4-H poultry show, competing against a much bigger group. No matter how he ends up placing, he said he will continue to care for his family of chickens for years to come, and that all the work he puts into his hobby will never be too much. "I just love having them," he said. "They're magnificent to me." Staff writer Kelsey Durham can be reached at 282-2237 or kelsey.durham@lee.net. Follow her on Twitter @CitizenDurham.